Win by Death, Incap or KO. No Summons stronger than 616 spider-man. Give reasoning to your vote. If I feel a vote is unjustified or biased I will not count it. @thor_parker82: I won't be able to post for a bit. My computer's not working. I'm backed up on 2 other CaVs because of it. @thor_parker82: Just promise me you'll do some more exotic prep. @jardinain2: @thor_parker82: Pfft. All your prep are belong to us. This tourney is still a thing? @krleavenger: Yea, it's doing fine. ET is just taking his time. He doesn't want to have a set time limit. Which works for me, since I have been sick and my comp has been broken for weeks. One of the most physically powerful bricks to ever exist in comic books, I present to you, Mangog. He is a being born from the collective hate of a billion beings which in turn empowers him, his people were killed and now he has the combined power of billions of beings as detailed throughout his existence, most recently in "Thor Vol. 2 #21". In the same issue, it was seen and stated that Mangog tore through all of Asgard by himself, there was no single warrior left standing and it was noted by Thor that Asgard had never been so decisively beaten. Yet again in the very same issue, Mangog gave a huge beating to the god of thunder and was completely unnaffected by everything Thor threw at him, and although Thor managed to get up after said beating, it is worth to note how effortlessly Mangog dealt with him and treated him like fodder. This is a basic outline of Mangog´s physical stats, he is one of the ultimate bricks surpassing in physicals the likes of Hulk, Thor, Superman, Doomsday and even being as invulnerable to physical damage as Juggernaut, I don´t see anyone on your team inflicting any physical damage to Mangog. Ultimate Reed Richards, the evil and smarter counterpart of the well known Reed Richards. "I'm going to do it. I'm going to show everyone. No. No. This is not about pride. I'm going to show them because I have to. I'm going to save them. I'm going to fix what's wrong. I'm going to solve everything... And we'll begin here... with you and me. We're going to have a new focus for my ongoing and never-ending eduction. The experiment will start with survival and end on a millennial tomorrow. My rules are simple... In the dome, it's evolve or become extinct. Welcome children... Welcome to tomorrow. I'm sorry. Most of you are not going to make it." I´ll start with some light feats and a demonstration of The Maker´s physical powers which while very impressive on their own, are not what makes him one of the most dangerous villains both 1610 and 616 universes have ever seen, that is more due to his genius and advanced creations, I´ll get to that later. When it comes to strength he´s been shown capable of completely restraining both Ultimate Thing and Doctor Doom making them completely unable to move, I´ll start with the former which happened in "Ultimate Fantastic Four #4 ". Now you may ask why is that impressive, well, it was shown during "Ultimate Fantastic Four #8 " that The Thing can effortlessly lift seven tons per square inch from each hand whereas Reed Richards completely made his entire body unable to move, effectively making this feat by using simple math as The Maker physically subduing a 100 tonner. But all of these are just minor showings compared to the true power that The Maker brings to this battle, since this is just an opener I won´t get too much into my strategy, but I just want everyone to know that 5 hours of prep anywhere for someone like Reed is overkill, he figured out how to stop Susan/Invisible Woman just 10 minutes after they broke up. 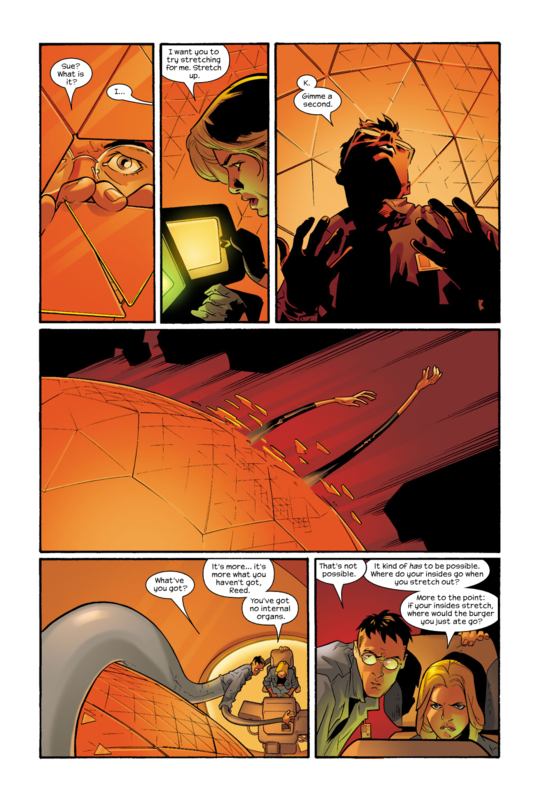 With basic knowledge on each of the opposing characters he can easily exploit their weaknesses and call it a day as soon as the battle begins, he´s previously built a machine capable of scanning every atom in order to find any possible disease in "Ultimate Fantastic Four #3" which can also be used to find weaknesses as well and exploit them. This is just a basic intro, I´ll save my strategy for my next post where I will fully dive into how to beat your team. @emperorthanos: I'll get to this soon. @thor_parker82: @zetsumoto: come on guys, dont let this tourney die in the semi-finals! @asgardianbrony: I won't. I just have 1 more post in another CaV to do, then I'll give this my full attention. @zetsumoto: cool. im looking forward to reading this debate once its finished. @zetsumoto: when will you be able to post? @emperorthanos: I'll probably have one up tomorrow (technically later if it's past midnight where you live). I am finished with my post. I just want to wait a bit so that I can proof-read it with a fresh mind. It'll definitely be up later. @thor_parker82: lol sorry. Got in a heated argument, and forgot to post this,. If you have ever seen the TV Show Supernatural; imagine Lucifer as a MASSIVELY ftl fire user and you would have Black. Black was once a low level telekinetic/magic user who became the host for a mysterious entity known only as the "King of Despair". He has the power to burn souls, rip people apart with telekinesis, and move fast enough to casually dance around a nano-second timer. What makes him even more dangerous is the fact that I have equipped him with the Creation Blade for 10 perk points. The Creation Blade is a sword forged from a weapon once used to destroy entire universes. It's completely indestructible, negates powers, and can cut through absolutely anything. Also known as the "Darkchylde", Magik is the ruler of Limbo, an inter-dimensional Nexus that connects to every space and time throughout the entire omniverse. She has the power to freely open portals anywhere, channel demonic energy, and has vast knowledge of spells. What makes her especially dangerous however, is the fact that she wields a sword that can negate magic and destroy any mystical object. Rachel is the daughter of Jean Grey and Scott Summers. She is an Omega level mutant with the power of telekinesis, telepathy, and cosmic fire. She is also the current host for the Phoenix Echo, a fragment of energy from the multiversal cosmic entity known as the Phoenix. We know every move you are going to make before you make it, and exactly what must be done to counter your team. With 2.5 hours we are free to make any number of preparations for the upcoming battle. With full knowledge, the ability to teleport anywhere, and a character who moves fast enough to clown nano-second timers; the possibilities are absolutely endless. We can do anything from amping our powers, to equipping armor stronger than adamantium, to procuring weapons from your own characters' stories in order to counter and defeat them. In order to keep from overplaying my hand and overwhelming you with too much to respond to, I keep to the bare minimum of what's necessary to win; and will adapt our strategy on an as needed basis. With amount of knowledge we are capable of gleaming in Limbo, we are free to create a strategy specialized for combating your team. As stated in prep, my team is able to freely adapt our strategy on an as needed basis, so we aren't restricted to any one game-plan. With the level of info we now have on your characters, we will know everything you have done during prep. Since this ability is more an aspect of being in Limbo, and not a part of Magik's actual power-set; your basic knowledge would not tell you anything about it. With this knowledge we can prepare for anything your characters have in store for us. Since you avoided revealing any specific plans, I'll just go over the various ways my team can take out your characters. First off, neither of your characters are particularly fast. Combine that with precognition from Limbo, and magik's portals are completely unavoidable as far as characters in this tourney are concerned. This is well above the strength and durability that you have shown for Mangog or Richards. I see no reason why I can't instantly frag them into pieces. As Black has been given the "Creation Blade", he has more than enough raw offensive power to put down either of your characters. As said in my opener, the Creation Blade is a sword forged from the fragments of a weapon capable of destroying universes. The blade is capable of cutting through absolutely ANYTHING. To make matters worse, neither of your characters have the speed feats to keep up with Black. Not only do you have to contend with a MASSIVELY faster than light character (wielding a one shot sword), you also have to deal with a magically cloaked one who has already seen the future, and knows exactly what he needs to do to win the fight. Since we know that Rachel's telepathy is probably the easiest ability to understand, and thus the most likely to be countered by your prep; she would only be using it sparringly. By sparingly, I mean only if we know from our Limbo Future sight that it's a safe way to pull a win. That was WITHOUT her Phoenix Echo. If either of your characters are left vulnerable to a mind attack, they will go down INSTANTLY. That is BLACK HOLE level telepathy. Far more powerful than anything either of your characters have shown to endure based on feats thus far. Furthermore, it too was also done WITHOUT Phoenix Echo. The only one I could possibly see surviving this, is Mangog, but even he would be immobilized under such power; allowing either of my other characters to dispatch him. With our prep in limbo, my characters have access to all the information they could ever possibly need. We know exactly how this battle will play out, before it even does. We know all of your moves before you make it, and all the moves we need to make to counter them. With my team's level of knowledge, we are free to alter our strategy based on what you reply with. Your "basic knowledge" perk may give you an idea of what some of our abilities are, but it will not tell you the mechanics of how they work. This will greatly hinder Richard's ability to counter them. Furthermore, neither of your characters are fast enough to avoid getting diced up by Black, teleported into pieces by Magik, or crushed into a singularity by Rachel. If either of your characters are left vulnerable to telepathy, they will instantly go down. As of thus far, neither of your characters can tank black hole level telekinesis from Rachel. Most certainly not Richard. Bottom line, all 3 of my characters have methods to put down your team. Perhaps the most dangerous in my team is Black, who (with the help of Magik) is capable of dicing up your entire team within a fraction, of a fraction, of a fraction, of a nano-second. @zetsumoto: Will post today in a couple of hours. Let me introduce you to your worst nightmare, a place that defies all modern science and is literally thousands of years more advanced than anything your team has ever encountered. The Maker is a prep time god, there are no chances for you to survive an encounter when I can have acces to 5 hours of prep anywhere, which brings me to a very interesting point, I present to you the most advanced facility in existence in all of Marvel Earths, The City/The Dome main headquarters of The Maker. By using our prep in Limbo, we are able to view all versions of the future. We can identify exactly who your characters are, view your entire history for full information, and/or see every possible way in which this fight can play out. There is a difference though, you can see many possible futures in Limbo, but you don´t know which one is more likely to happen whereas I do, as you can see in my scan above, The City calculates how possible it is for each scenario to happen, simply put, you´re not going to surprise The Maker. Fancy wording, sadly one that serves little purpose when you take into account the very limited amount of prep time you have, then add the fact that none of your characters are geniuses nor prep master, hell, they´re not even prep "apprentices" lol, so I don´t see what you can do with 2.5 hours of prep besides just trying to make an attack plan based on what Limbo shows your characters what my team´s powers are, which brings me to my next point. Both Mangog and The Maker have lived for eons whereas you only have 2.5 hours to check their history, not nearly enough to consider yourself having "full knowledge" on my team, you don´t even have 1/1000000000th of both my character´s lifespans pal, you´ll just have the basics like Mangog being a being of pure rage and nigh-invulnerable to physical damage and Reed being the smartest person to ever set foot on earth. It´s hilarious that you are trying to argue your team outsmarting and out-prepping the greatest prep master in both Marvel and DC, it becomes even funnier when none of your characters have ever done anything noteworthy with prep. Anyway, I´m not entirely sure if you could even look at what happens inside the dome due to it being a completely different thing to any other place on the planet, not only is there time dilation, but it is also an entirely closed system. So it is possible you couldn´t even look at what happens inside The Dome. The Maker can see invisible things as far fetched as that sounds, his perceptions are so good and evolved that he can see Susan Storm while she was in her invisible form. On another occasion, he spotted Falcon using "The City" even though Sam had taken a serum that literally synched him out of reality in "Ultimates by Hickman #5 & #6". So Reed will see every person even if they are "invisible". As stated in prep, my team is able to freely adapt our strategy on an as needed basis, so we aren't restricted to any one game-plan. Much talk no show, you have 2.5 hours pal, that´s barely enough time for your non-leaders/non-genius team to make a single strategy or attack plan, let alone have multiple contingency plans for a dozen of scenarios that may or may not happen, you have no idea what scenario will take place and a very short amount of time to prepare, your characters do not possess the qualities of a "prepper", they don´t have any noteworthy feats in the prep department. With the level of info we now have on your characters, we will know everything you have done during prep. No, you won´t, The Maker has lived for over a thousand years inside "The City", you can´t take a look at all of his lifespan, not even close, and there is nothing interesting nor anything you can do to counter Mangog even if you had full knowledge on him, he´s an unstoppable brick physically stronger than Hulk and as invulnerable as Juggernaut, you simply can´t deal with him. Magik's portals are fast enough to board a space-ship moving at interstellar speeds (as in quickly traversing distances measured in light years. Combine that with precognition from Limbo, and magik's portals are completely unavoidable as far as characters in this tourney are concerned. Limbo does not give your team precognition, it gives them a look into possible futures that may or may not happen, you have no idea which scenario will go down, let alone every movement my team will make so you could use your portals half as effectively as you claim. Her portals are powerful enough to teleport off the limbs of a character who can rip apart and throw stars with his bare-hands. This is well above the strength and durability that you have shown for Mangog or Richards. I see no reason why I can't instantly frag them into pieces. I do, the very simple and cold fact that Magik is morals on and doesn´t go around tearing off limbs from her opponents, even in the unlikely case she tries to do that, The Maker can still survive without organs and limbs, he doesn´t have internal organs and his body has no need of oxygen, not to mention Susan tried to kill him by expanding a force field inside his brain and it didn´t work. Hell, Ultimate Franklin Richards with the Phoenix Force was unable to kill Reed despite trying to burn every atom in his body. Finally, something worthy to be called a challenge. I already dealt with your "cloaking", it´s useless as both Reed and Mangog will see your characters thanks to The City pinpointing their location, as for seeing the future, he has seen possible futures and has no idea which one of them could occur, even if he did somehow knew what was going to happen, it won´t help if he can´t overcome it, paraphrasing what @jardinain2 said in the last round, "if I know the future and I´m in a cage with the Hulk, it doesn´t matter what I do, I´ll eventually lose because I simply don´t have what it takes to overcome any possible scenario". This is your case, you are facing the greatest genius you have ever encountered, thinking you can outsmart him is very naive, by the time you try to face him, The City will have already run several scenarios and laid out how possible it is for each of them to happen, then Reed acts accordingly. For starters, he´ll know that your character is FTL and wielding a "one shot sword" as you called it, he´s going to deal with him first and as quickly as possible, which means he won´t be much in the field. Now, let´s dive into how I take out Black. The Maker grabs one of his many inventions, in this case, such invention allowed him to overpower an omega level omnipath and shut him down/kill him with TP of his own. As soon as the battle starts, Reed and Mangog will be encased in a force field, the same kind that took multiple strikes from several members of the Thor Corps and made 616 Susan (yes, it was her 616 version) to claim that The Maker´s forcefields are far above her own. Reed wil also summon his own personal super-evolved army called "The Children of Tomorrow" (I´ll get into more detail about them in a minute) to swarm your characters, many will probably die to the FTL Black, but they will have served their purpose as a distraction, because by the time he kills a couple dozen, he will be put down by The Maker´s telepathy. Rachel is such a powerful telepath, that she was able to simultaneously invade the mind's of the entire planet. With Phoenix Echo, she's able to use here telepathy on a GALACTIC scale. If either of your characters are left vulnerable to a mind attack, they will go down INSTANTLY. Sadly for you, telepathy would be a very bad move on your part, The Maker overpowered an omega level omnipath and shut him down/killed him with TP of his own, if anything, trying to use TP on Reed will prove more risky to Rachel herself since she would most likely be overpowered by Reed´s own telepathy granted through a technological device. In addition to this, she also has telekinesis powerful enough to crush objects into a singularity. That is BLACK HOLE level telepathy. Far more powerful than anything either of your characters have shown to endure based on feats thus far. Furthermore, it too was also done WITHOUT Phoenix Echo. Why call it black hole level telepathy though ?? Is a singularity always at that level ?? Anyway, as shown earlier in this post, Ultimate Franklin Richards with the Phoenix Force was unable to kill Reed despite trying to literally burn every atom in his body, and Mangog has withstood anti-matter attacks without even flinching, so I doubt they´ll be put down by telekinesis. Either way, it took Rachl quite a while and a lot of concentration to achieve that, something she won´t have here. As you can see, it required time and concentration, both things she doesn´t have in this battle, your team will be too busy facing two hundred "Children of Tomorrow", who are The Maker´s personal super-evolved army bred for specific purposes in chambers, they are the perfect civilization. The rules only allow Spider-Man level summons, so Reed will have them modify their exoskeletons to be the same stats as Spidey, so just imagine you´re facing two hundred Spidey level characters, they might not be too much but the sheer number will keep your characters occupied, and Rachel won´t have the time to do her telekinesis trick, then she will be taken out of the fight by Mangog, the same guy who has ragdolled Thor and all of Asgard´s army by himself, Rachel doesn´t have the durability to survive more than a couple of strikes from Mangog. Now this is what true prep looks like, unlike your team, The Maker is a prep master, but that´s not it, he is the GREATEST prep master in the Marvel universe alongside Thanos. Any strategy the feeble minds of your team could come up with, Reed will have already countered them and/or come with a solution before your team even thinks about using said strategy. I´ll present you with some things your team could come up against, besides the already mentions of how I specifically deal with each of your characters (in said character´s section), I will provide scenarios which could take them all out at once. The Maker was one of the sole survivors of the multiverse that made it to Battleworld intact by Doctor Doom´s reality warping, everyone was planning on trying to defeat Doom and returning the world to how it was, but of course The Maker had his own plan and tried to take the power for himself, that´s not where I´m going though, The Maker knew that 616 Reed would be a problem, so using basic materials from a "retrogade world" as he called it, he built a device the de-evolved 616 Reed into an ape as shown in "Secret Wars #8". If he built that with limited materials in a "retrogade world", he´ll have an easier time in doing it on The Dome/The City and encase your team members in it while they´re dealing with Reed´s army, thus transforming them into helpless apes. 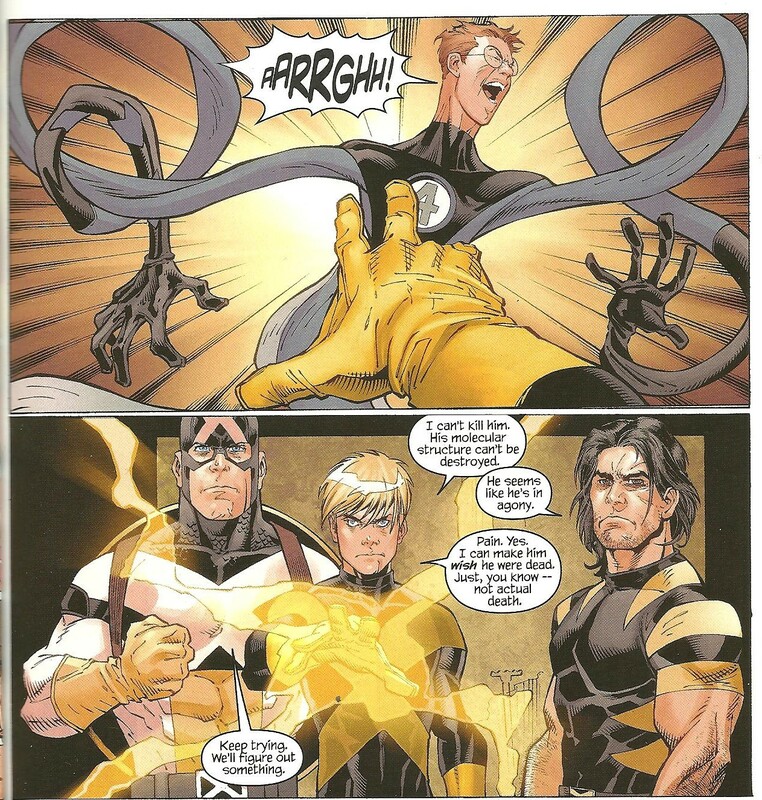 Very simple, The Maker grabs an anti-matter device with a city-wide blast radius that annihilated all of Washington D.C as seen in "Ultimates by Hickman #9" , he then detonates it on your team´s face, meanwhile he just teleports himself and Mangog back to The Dome without harm. None of your characters has the durability needed to suggest they can take such a blast directly to the face. Your team only knows possible scenarios and doesn´t have any idea which one could happen, whereas Reed´s A.I. analyzes and predicts how exactly possible it is for each scenario to happen so he can act accordingly. Magik´s portals are just that, she doesn´t go around tearing off limbs like you´re claiming she would here, her physical stats are mid-tier at the very best, she´ll get one shotted by Mangog while she is distracted dealing with The Children of Tomorrow. Black will be put down by Reed´s technological device that grants him omega level+ telepathy before the former can make good use of the creation blade. Rachel Grey needs time and concentration to use her telekinesis at its full extent, something she doesn´t have here as she´s dealing with the Children of Tomorrow, and just like Magik, her stats are nothing impressive and would go down to a couple of strikes from the invulnerable Mangog. @zetsumoto: @thor_parker82: Looking good. How many posts do you guys think you will be doing? T4V. I finished Blood Blockade Battlefront recently so seeing Black in a debate would be interesting. I am good with like 1 or 2 more posts. I'll just do my post and he can make his third, and I'll just play it by ear on whether or not I feel like I need a third as well. 1 or 2 more sounds good for me. Unfortunately for you, Limbo is your worst nightmare, as it's one of the most dangerous mystical realms in existence. The Maker may be a tech genius, but a sorcerer he is not. 200 gremlins running around your prep is going to backfire pretty hard. As far as I am aware, the City does not have true precognitive abilities, rather it functions much like the Battle Computer. As such, it has the limitation in that all of it's predictions are based on the information presented to it. You have very little information to present, as all you have is a basic knowledge perk. Basic knowledge will give you the general gist of my character's abilities, but it will NOT tell you how they function or the full extent it can be used. Magik is a mutant teleporter with vast magical powers and command over an army of demons. Rachel Grey is a omega+ level mutant who specializes in telekinesis and telepathy. Black is a supernatural entity with vast powers of soul-fire and telekinesis. That's it. That's hardly anything for the computer to work with. Furthermore, these types of computerized predictions are ALWAYS beaten out by true future sight, as it cannot account for alterations in our tactics based on our knowledge of the future. Yea, that's not how limbo works. You probably shouldn't make up limitations for your opponent's characters. It looks bad. Limbo sees many possible futures and it also shows the choices that Magik can make that leads up to each of those futures. All she has to do is look for the future with a desirable outcome, look at the choices she makes that lead to said outcome (which by the way, would be a future that already accounts for your precognition), and bam that is THE future. Bottom line, my team just has to make the "right choices" and that will lead to the future in which we have won the battle. none of your characters are geniuses nor prep master, hell, they´re not even prep "apprentices"
lol the irony is that not only is Magik a prep master, but she was also an APPRENTICE to none other than... 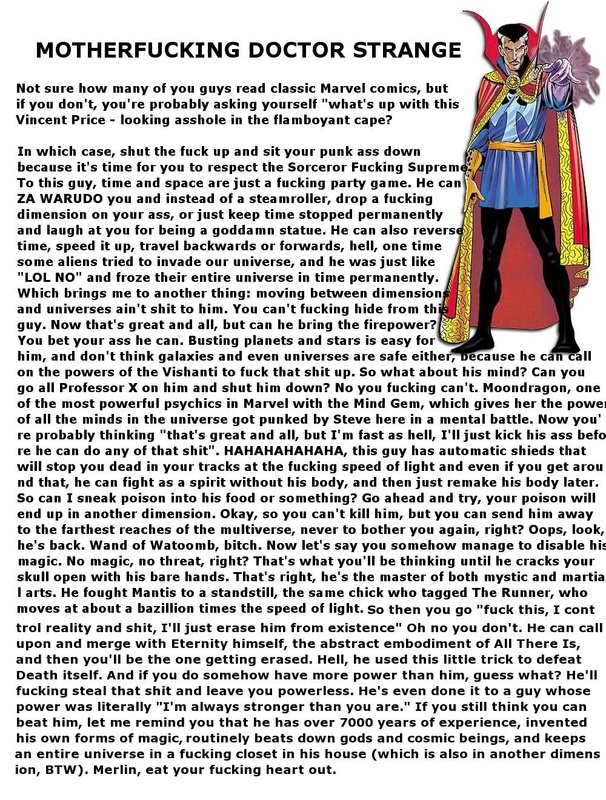 The mother-foookin Doctor Strange! It´s hilarious that you are trying to argue your team outsmarting and out-prepping the greatest prep master in both Marvel and DC, it becomes even funnier when none of your characters have ever done anything noteworthy with prep. Never done anything? She's beaten Dr Strange, Bellasco, Mephisto, Legion, Juggernaut, the Lattice World Eater, and so on. You want to talk prep, how about perfectly orchestrating events to bring down the Elder Gods? You know, the guys that even the entire Hell-Lord council, including Dormmamu, fears? Or simultaneously taking over every single timeline, to the point that there was only 1 possible future? so I don´t see what you can do with 2.5 hours of prep besides just trying to make an attack plan based on what Limbo shows your characters what my team´s powers are, which brings me to my next point. Yawn. Everyone makes this argument. It never goes anywhere. All the information my characters could possibly need, can be gleamed from looking at futures in which we win. The rest is simply to cover our bases. Lets start with Black. You know, the guy who can react in nano-seconds? Do you realize how much time one can view in straightforward with nano-second processing speed? 7 million years. Next we have Magik. Fun fact about Magik is that her teleportation requires her to calculate exactly where she wants to land. Back in her early days, she was unable to teleport on to a rocket because she was scared she wouldn't be able to calculate her portals quickly enough; causing her to either miss or go splat. These days she's timing lightning, Mjolnir throws, Explosions, and spectrum blitzes. Magik plays this scry vs scry game all the time. If the above isn't enough, I can scan-dump in my next post. The Maker can see invisible things as far fetched as that sounds, his perceptions are so good and evolved that he can see Susan Storm while she was in her invisible form. On another occasion, he spotted Falcon using "The City" even though Sam had taken a serum that literally synched him out of reality in "Ultimates by Hickman #5 & #6". The first scan specifically states that the serum's flaw is that harmonics (sound) knocks things back into "order". In other-words, though the serum can cause the object's frequency to shift, sounds made by the object will still naturally re-synchronize with our frequency of reality. This is confirmed with his last warning, in which he specifically says "Keep your mouth shut, and there's your way in". How does the Dome detect him? Sound... It detected micro-decibel exhalations. Decibels are a measurement of sound. The City literally heard him breathing. That's all. That's Daredevil and Wolverine tier. lol you must not be very familiar with Magik. Her brutality CONSTANTLY puts her at odds with the other X-men. Fact is, Mangog is a monster. She has no reason to see Mangog any differently than one of the many demons she slaughters on a regular basis. As for the Maker. He's a psychopath and a threat to the entire world. Even worse, he's an affront to everything that her version of Reed stands for. She likes Richard. The fact that you wear her friend's face, would only make things worse for you. Sure, tele-dismemberment may not always be her immediate go-to move. However, she has no moral qualms against it. If upon viewing the future, she sees that that's the best way to take down your team, she will not hesitate to do it. The Maker can still survive without organs and limbs, he doesn´t have internal organs and his body has no need of oxygen, not to mention Susan tried to kill him by expanding a force field inside his brain and it didn´t work. So? What are you going to do when your limbs are scattered across the planet? I have met my win condition, I don't need to kill you. Reed has no magic resistance. Yes, magic resistance is a thing in Marvel, and it's extremely important for surviving these types of spells. Rudimentary sound detection is useless against Cytorrak cloaking magic. We know which one will occur because we know what actions must be taken to MAKE the desired future occur. If anything, your Dome is the one actually suffering from this dilemma, as probabilities are just probabilities, and you don't even have enough info to be accurate with said predictions. "if I know the future and I´m in a cage with the Hulk, it doesn´t matter what I do, I´ll eventually lose because I simply don´t have what it takes to overcome any possible scenario". lol this might have had more weight if you didn't JUST declare my team as a "challenge" that breaks up your usual tempo. From my point of view, you guys are the ones stuck in this mess. I mean seriously, Black could kill your entire team, summons and all, before you even blink. The Maker didn't generate telepathy. He hijacked the telepath's own carrier wave and used it against him. If Black isn't TPing you, then there's no evidence you can TP him. Even if you could bypass Magik's spells, Rachel would simply defend Black by launching her own attack and forcing you to pay attention to her. Every time Black passes through one of Magik's portals, he temporarily passes through limbo, which would cause any telepathic hold you have on him to immediately break. Note, this is not BFR, as Nightcrawler's teleportation works the same way, and that is an ability that's even offered as a perk. It took, what, 10+ seconds to bring down that Omnipath? Black would have blitzed Richards and Mangog within the first fraction of a nano-second. The Creation Blades cut the Tao, who was powerful enough to remake the entire world. The creation blades would cut through your force-field just fine. Hell, Magik could just teleport Black inside your barrier, or teleport you outside of it. Reed will also summon his own personal super-evolved army called "The Children of Tomorrow" (I´ll get into more detail about them in a minute) to swarm your characters, many will probably die to the FTL Black, but they will have served their purpose as a distraction, because by the time he kills a couple dozen, he will be put down by The Maker´s telepathy. Nice, you summoned a bunch of statues. Why on Earth would Black waste time trying to cut up a bunch of nobodies who wouldn't even be moving from his PoV, when he can simply skip through a portal directly into chopping up both of your team members + your Dome thingy? Or shower them in building busting lasers. He overpowered an Omnipath that wasn't immediately on the attack. Furthermore, did that omnipath even have any actual feats? Omnipaths can very quite massively in power. You know who else is an omnipath? Kid Omega. You know what happened when he stuck his head where it didn't belong? Omnipathy is planetary. Rachel is galactic level in telepathy. Meant telekinesis, but yes. In order to squish matter into a single point like that, it requires Black Hole levels of force. she will be taken out of the fight by Mangog, the same guy who has ragdolled Thor and all of Asgard´s army by himself, Rachel doesn´t have the durability to survive more than a couple of strikes from Mangog. Not to mention she could just teleport herself or any member of my team out of the machine's effect radius. Or use her own abilities to disrupt the machine itself. Both of my other characters have powerful TK abilities, and could just destroy the machine to escape. just like Magik, her stats are nothing impressive and would go down to a couple of strikes from the invulnerable Mangog. lol no. Magik would slaughter Mangog. She's faster than him, teleports, and has a sword that hard-counters supernatural entities just like him. And that's without even getting into her phasing powers. You have vastly under-estimated my team's prep potential and skill. You don't have enough knowledge to prep as effectively as you claim. My team knows exactly what steps we must take to annihilate you. Your summons are useless, as they are way too slow to prevent Black from killing everyone, and I have my own army that can keep them distracted. You have not proven you can take the Dome on to the battlefield, and even if you could, my team could instantly destroy it. You have no way to detect my characters, much less fast enough to avoid a blitz. Mangog would not win a fight with Magik or Black, and either of them could slaughter him if he even tried to get to Rachel. Your second scenario provides me with yet another way of annihilating your team. Mangog is magic based, and gets hardcounterd by magik. Reed is tech based, and I can control technology via magic. Once again, Black can slaughter your entire team before you can even process a thought. Do you realize how much time one can view in straightforward (In a single second) with nano-second processing speed? 7 million years. @zetsumoto: Man, you´re going to kill me, I haven´t even started it due to some personal stuff, but give me maximum 12 days and I´ll have it, I´ll try to have it sooner if possible. @thor_parker82: take your time. There isn't a rush. And I rather not have a drop out. @emperorthanos: Don´t worry, I won´t drop out. @zetsumoto: why do you always have cancer inducing teams? Bro you have a MFTL combatant with creation blades, a magik user who might as well be mini-strange,(who you got for 3 points) and Rachel Grey. You have a broken setup and a broken prep strategy as well, I'm hoping someone can make a convincing argument and actually destroy you in these tourneys. I'd have been perfectly happy with just Magik + Black. Not really. I am pretty sure you guys died or were incapacitated before Rachel even blinked. Black wasn't going to blitz my team with Super Buu's level of speed..... having the combined might of several FTL powerhouses, along with feats of blitzing FTL+ combatants? And at his weakest beating FTL combatants that beat FTL combatants? If anything Buu blitzes your team. But I had no counter, no knowledge and no prep, I simply didn't construct my team well enough and didn't have an appropiate strategy. And the fact that Buu is a psychotic planet slaughter and Kirby is a protector of planets kind of makes my team unbalanced and unstable. I hope another high tier tourney comes up so I can come up with a more creative team. DBZ speed is extremely inconsistent. Nothing to really put Buu on Black's level. I'll stop here, before this turns into a full-on debate. I'll leave that for another time.